This is one of those books you would really want to have on your bookshelf, in print form, rather than just experience on the e-reader. With a gorgeous, glowing red cover, and red print used for page headers and illustrated footer, it’s beautiful to look at. I’ve not come across a regular paperback that splurges on using a coloured print before, so it is really worth commenting on, and, for me, reflects some of the quality of the book itself. Avery Hood is found in the woods, by the remains of her murdered parents, covered in blood and with no memory of what happened to them. With the support of her previously somewhat estranged grandmother, Avery starts to try to pull her life back together, but events don’t make that easy. Used to living close to nature, Avery struggles to assimilate to life with her grandmother, and fights to keep her family home in the woods. Then a new boy, Ben, makes her feel things she has not experienced before, but she wonders if she can actually trust him, with the secrets he holds. And then there’s the mystery of her parents’ murder – is Ben involved, or is there some motive that Avery has not yet grasped. 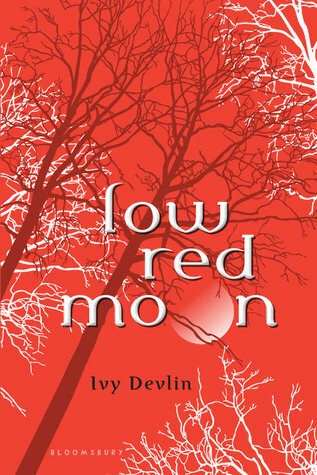 In case you haven’t guessed by the title and the protagonist’s name, this is a riff off the Red Riding Hood fairytale, just one of many books, films and television programs currently riding the fairytale retelling wave, but Low Red Moon does it in a way that really just uses the bare bones of the tale as inspiration for the narrative. And while I did pick the resolution to the crime element of the story, that did little to detract from my overall enjoyment of the novel. Recommended, but do try to get a copy of the paperback – it’s lovely!